Throughout history there have been many stories of encounters with and deals with the devil. 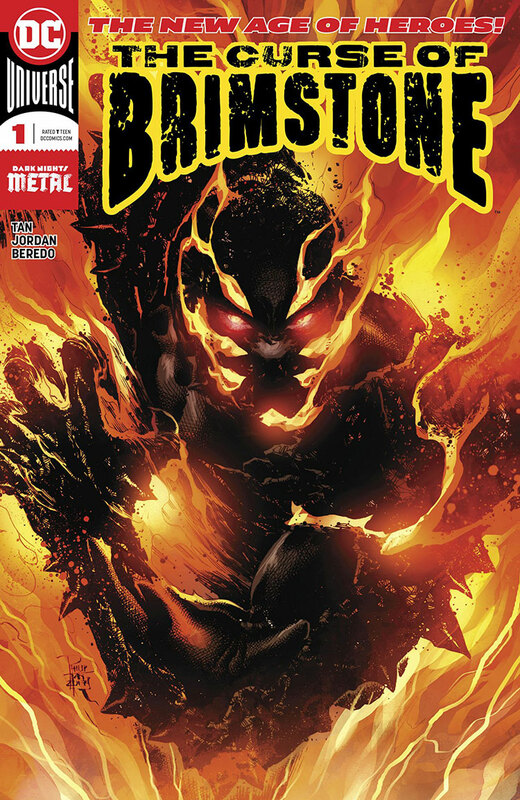 With the launch of DC Comics’ new series, The Curse of Brimstone, we encounter a new take on a hero created by evil. It is a part of DC’s new initiative to create a “New Age of Heroes” and is a stark change of tone from what we have come to know about the DC pantheon of heroes. Phillip Tan and Justin Jordan bring a breath of fresh and different air into the DC Universe that has just opened itself up to new experiences for the readers and creators. Instead of the super-hero protagonist that mainstream audiences are used to, they bring a creator-owned character and story feel to the already established world. The first issue is for the most part slowly paced as it introduces us to Joe and his stagnant life and small town. Joe seems to be an unusually caring person about his city. While others may be in a rush to get out, he is focused on what the city was and could be again. It’s a characteristic that hints at his worthiness to become a hero and not a monster. Although we don’t have but a few moments with the titular character the basis for his psyche is apparently laid out through the introduction of who he was before. Tan and Jordan have done a wonderful job at creating an air of mystery in the town, characters, and in the story overall. It keeps the reader from losing interest and looking forward to each new panel and page turn. There is also a lot of symbolism throughout the story that foreshadows events in the coming pages. The story is extremely enjoyable and not just another super origin story that may be associated with the publisher. The setup promises to give readers something new and unique in an already awesome universe. Phillip Tan delivers outrageously beautiful artwork in this first issue. Again, it brings the feel of a creator-owned comic to the DC Universe. Panel layout is interest piquing throughout and the backgrounds look beautiful. The feel of a dead and decaying small town is translated with skill as everything looks tired and beat up. Tan has also done an excellent job at capturing emotions in the poses of the characters. Younger characters are loose and have more of a carefree spring in their poses while the older folks looked weighed down by the heavy metal of time. There is a lot of depth to each panel and page that has been carefully planned out and brought to life with colorist Rain Beredo. Beredo hits the reader with a barrage of intense colors that bring even dingy beat up cars to life. There are a lot of dark moments throughout this issue, but they still are alive with color. The brighter moments are, of course, just as beautiful. The instant that Brimstone springs to life is an assault on the senses that is very welcomed. Wes Abbott does an excellent job at lettering this issue. There are lots of chances for him to increase the emotion of the moments with some creative lettering choices. There are a few places throughout that are dialogue heavy, but the lettering is well spaced out and takes the reader through it in a breeze. Overall, The Curse of Brimstone is a great start off to a new series. It will be a welcome addition to this new world of heroes that is being brought in to stir up the pot. DC has done the smart thing and brought in some excellent creators that will take this character in the right direction. Readers are highly recommended to pick up Brimstone and get hooked on an exciting new character.